Window coverings can be a big expense and, depending on where the window is located with reference to sun exposure and heat, an added consideration. But, if none of the above are a consideration, simple and inexpensive options are available. For instance, we have a pair of interior windows, odd yes, but more common than you might think. If you have a home where a room was added to the exterior of an existing room and now encompasses what had been an outside window, you have a room within a room. 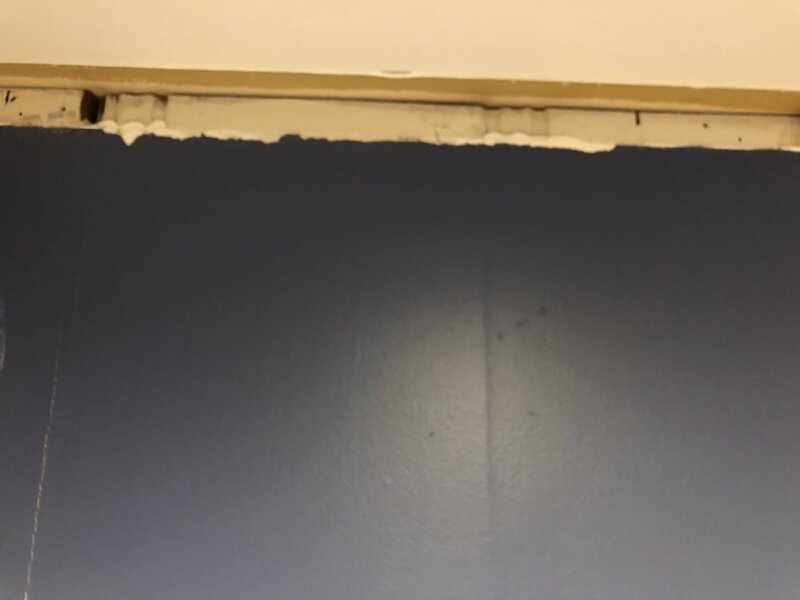 Perhaps the window should have been covered over with the new walls of the expanded room, but often that is not the case, when costs are considered. Still not optimum. In our case, the outside atrium was enclosed to be an inside atrium complete with a fountain, I will cover that in a few years, stay tuned. Back to the issue at hand. The room currently being worked on, is the TV room. Originally it had been a formal dining room. Sometime in the 1950’s-1960’s I imagine it was changed into a den, I am guessing here. The large picture window that had looked out onto the atrium was removed and drywalled on the inside and stuccoed on the outside. It is possible that the two side lights in the dining room were original to the house making the room quite light and bright; imagine a large picture window and two floor to almost ceiling side lights. Once the picture window was walled in and the door that lead from the living space to the dining space was closed off, there was only one door into the room from a hallway, and only the two long side lights for outside light. The windows were stationary, so no outside fresh air was available, but they had installed “modern air conditioning”. This made for an ideal cozy den or TV room. The problem I have with my downsized circumstances (so few complaints) is that I do not have a closet convenient for my vacuum cleaner. I have a bi-fold screen that I can “hide” the vacuum behind in my office, but it is in front of one of the two windows in the TV room. Not a lovely thing to look at from the TV room, not too bad from my office (the room that was created as an interior atrium). What to do? At first, just to cover part of the window, I put up a pretty textured rice paper, but always intended to make something a bit more refined. I decided a fixed panel would solve that problem. I have used IKEA sliding panels in several other applications for years. Naturally, those panels change styles, and I had to find a current one that was acceptable to me. I found a simple white panel with an interesting thread pattern and cut it to fit the window, made a pocket on the top and bottom for a slender rod and had it attached to the frame side of my office window. This is the same thing I did to partially cover the window in our back door and two bathrooms, where we wanted a little privacy, but not full coverage; allowing for more light in both cases, but obscuring the ability to view into either space. The IKEA sliding panels are great at hiding windows, doors or unattractive views. I first used these panels in my daughter’s private practice office. She had a private bathroom that she did not want visible. The panels made for easy access, but was virtually invisible to anyone looking at the room. This same set of sliding panels has been used in subsequent offices, once to divide a lobby from a storage room and currently, again to obscure a door to another part of the building. 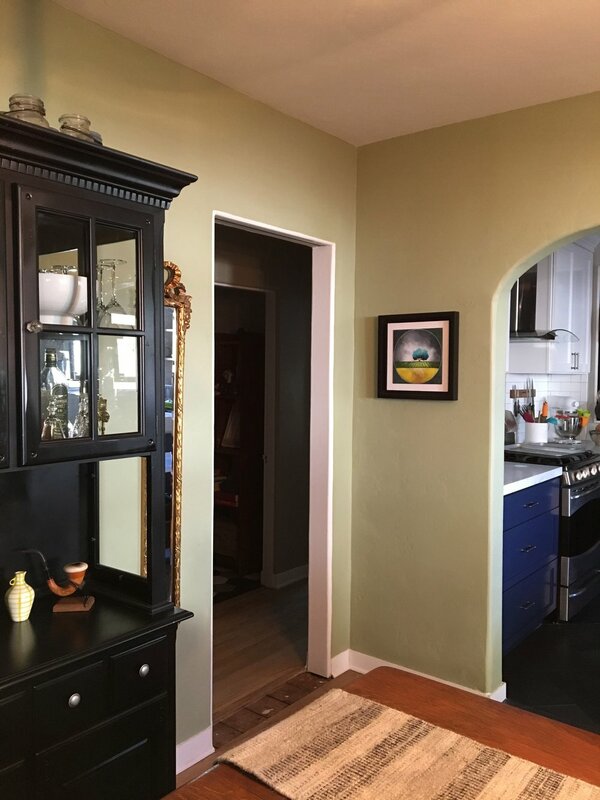 Several weeks ago, I got a call from a client, asking for help with a kitchen; they were buying a “new” to them house, and could only afford to paint the kitchen cabinets for starters. 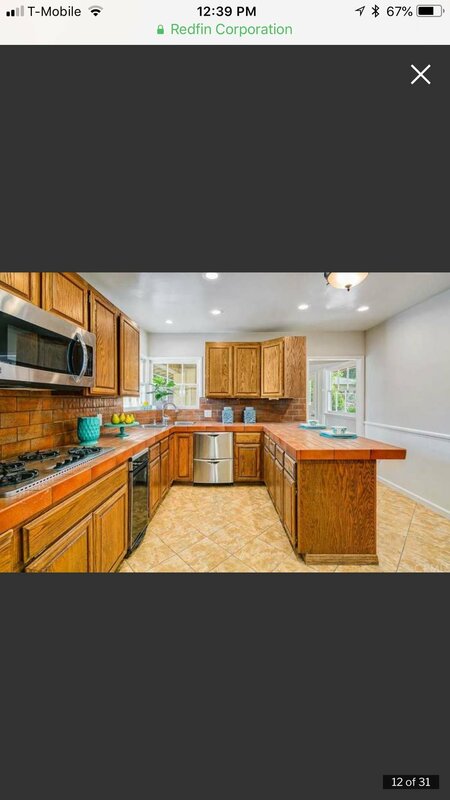 A real estate picture of the kitchen was sent showing the kitchen. I could only see a glaring odd bank of cabinets hanging on the wall, “what were they thinking”, I wondered. When I met my client at the house, I asked if she’d consider removing the odd bank of cabinets and we could replace them with open shelving; to sweeten the idea, I suggested she would then be able to display her favorite ceramics from Ireland. Fortunately, she loved the idea and it was agreed that the cabinets could come down. The odd bank of cabinets consisted of a pair of wall hung cabinets and one corner cabinet hung awkwardly over the peninsula. This corner cabinet cut off a view of the backyard and closed off much needed light into an already the dark kitchen. We decided on a two color combination for the cabinets and some hardware for a more updated look. This would go a long way to brightening up the dark, dated kitchen with its brick ceramic countertops and nondescript floor tiles; both will change as the budget allows. Once the cabinets were down I found four layers of wallpaper! Fortunately, only behind one of the cabinets. The top layer consisted of only a small tab of the former paper, the next layer appeared to be from 1970 in all its bright yellow and orange daisy, vinyl patterned glory. Once that was stripped off, the next layer revealed was something from the 1950s I believe, cute for its time. But wait, there was more; I stripped off each layer as carefully as possible to capture the history of this kitchen which was new in the 1940s. The last layer was a paper that could have been from the 1930s, as patterns did not change as rapidly as they do today. It was a sweet depiction of a victorian kitchen with an old wood burning stove, large farm table laden with baked goods including cupcakes, cookies, cake, bread and all the while the mother is mixing up more batter; a dog rested in a box near the stove, nursing her puppies. A kitty sleeps nearby, and it appears that granny is sitting at the table (her spectacles are on the table near an open cookbook) but only her skirt is shown. The paper is like a time capsule of early victorian life and it must have seemed like an appropriate walk down memory lane for the homeowner of the late 1940s. I took pictures of each paper as it was revealed and made prints so that they can be framed and put in the laundry room as a reminder of days gone by— a bit of history for the house. Once the cabinets were painted and the hardware installed, the kitchen had a fresh feeling. Patching and painting the wall where the cabinets had been was next, we liked the IKEA brackets, but not the shelves that fit the brackets, so we found a lumber yard that carried “full sized” boards, my handy husband planed them down to fit, and I stained and finished them. 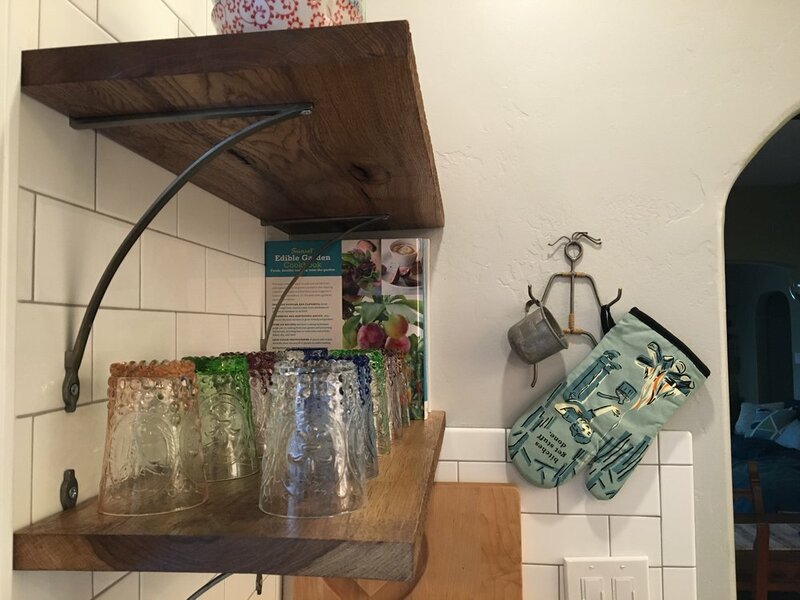 Once the shelves were installed the kitchen began to feel more updated and belonging to the current family. 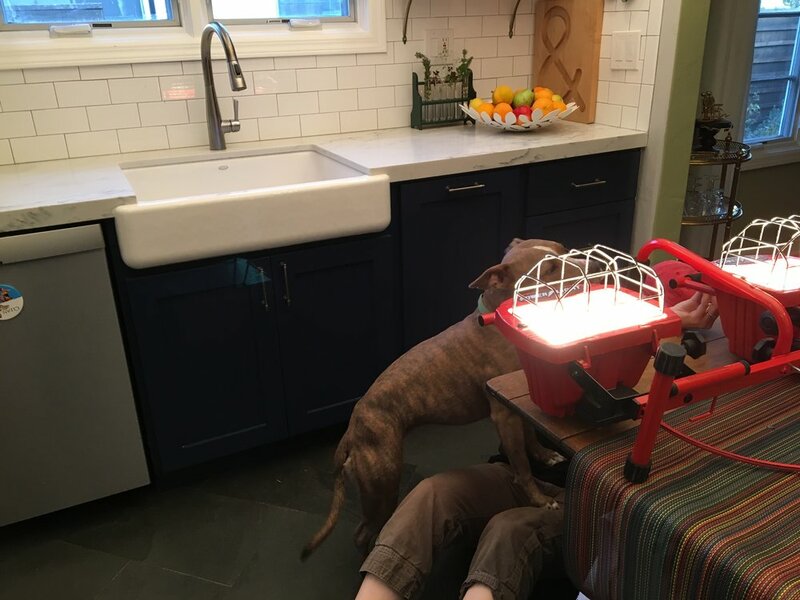 While it is not my client’s ideal kitchen it is such an improvement over what it had been, it feels almost ideal—for the time being at least. As time and budget allow, there are several ideas I have for the adjoining laundry and pantry rooms; all rooms are separated by walls with standard door openings. The pantry room actually has three doors on each of three walls. I know we can make this room much more efficient by closing off two of the doors, the family may consider non-non-essential. Several months ago, I shared the beginning of the hall bathroom “gut job”, where handy hubby tore the room apart to the studs. Well, it’s finished and has been for sometime now. I thought I would wait until we had gotten the doors painted in the office behind the bathroom to close out this project, but that may be awhile yet. You may recall the toilet appeared to be sitting in my husband’s office, while convenient, hardly private. The problem with this bathroom was always the placement of the toilet; right in the center of the door in the hallway that also framed the kitchen. I am certain that no one wants to see that from a kitchen. Moving the toilet to under the window where the vanity sat had always been the plan. In the course of changing out the fixtures, it was apparent that the walls needed to be opened to move the plumbing and some wiring as well. We did have several of those, HGTV moments, when walls are opened only to discover dangerous plumbing or wiring that could have resulted in floods or burning the house down. It was like an archeologist dig. We discovered the small window that was in the bathroom had been more than twice as large when the house was built in 1938, in fact there had not been a hall bathroom, but most likely a laundry area off the back door. To enclose the room, the window was cut down and installed poorly and out of plumb. That was corrected and a new level, matching sill was made. The shower was expanded 4 inches, which makes a big difference in a small space. New fixtures and a niche were added along with bright white subway tile; simple and no fuss in the tight quarters was the best choice. The standout in the bathroom would be the vintage pedestal sink, the decorative floor tile and pretty light fixture over the sink. The sink was the splurge, but it was a great size and just so pretty, I could not imagine anything else in that alcove. To set the sink off, the floor was the next thing to catch the eye, it is a bold, black background with a white and taupe to gray snowflake like pattern. This pattern would be much too busy for my taste, if it were not limited to a small space, below eye level. You certainly notice it, but with the sink, mirror and light fixture, it is not overwhelming. The shower floor is a black pebble stone. I did not want it to have to compete with the flooring outside of the shower and did not want it to be white to draw attention to it; this way it visually expands the bathroom floor without being obvious. You may also remember a post about the door that we installed on barn sliders, allowing more space in the tight quarters, no door swinging in to take up valuable space. 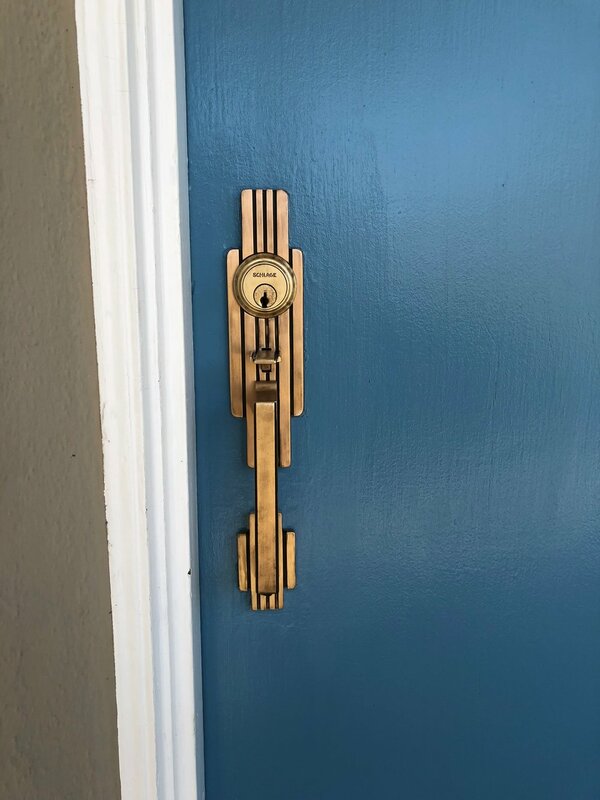 We even found a clever lock for the inside of the bathroom door. 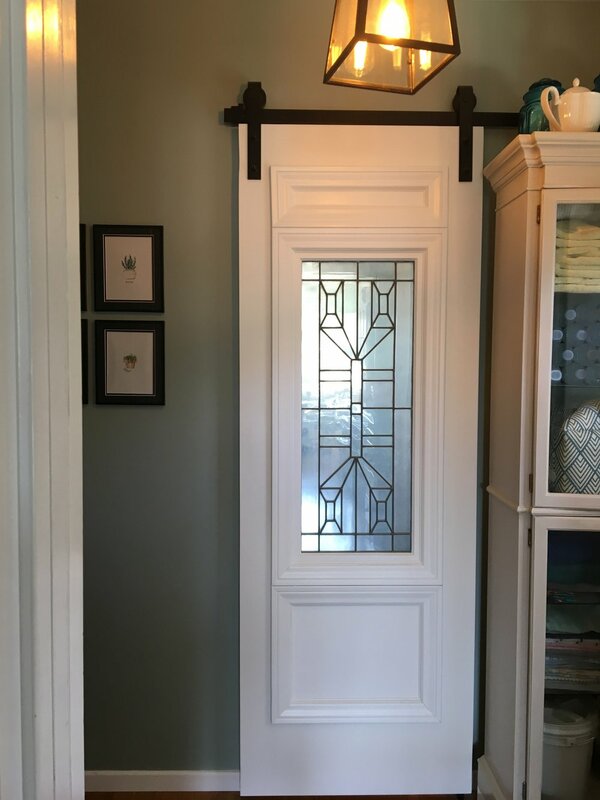 The beveled glass insert in the original vintage door had to be obscured for privacy, and a piece of glass that I put an antique mirrored finish on it worked perfectly. The inside however, was a piece of plywood to hold the glass in place. I covered it with a piece of wrapping paper, that matched the color of the walls. The room is small but adequate and we could not expand its footprint, making smart choices in the finishes was important. If you can picture a room with four refrigerator boxes set on four walls with not much space in-between, you can imagine the approximate size of the space. The shower is one box, the alcove where the sink is another, remember that is pushed into the office, the third box is the toilet space and the box left over is the floor space. A tidy space but very functional. I am not yet ready to tackle the master bath. 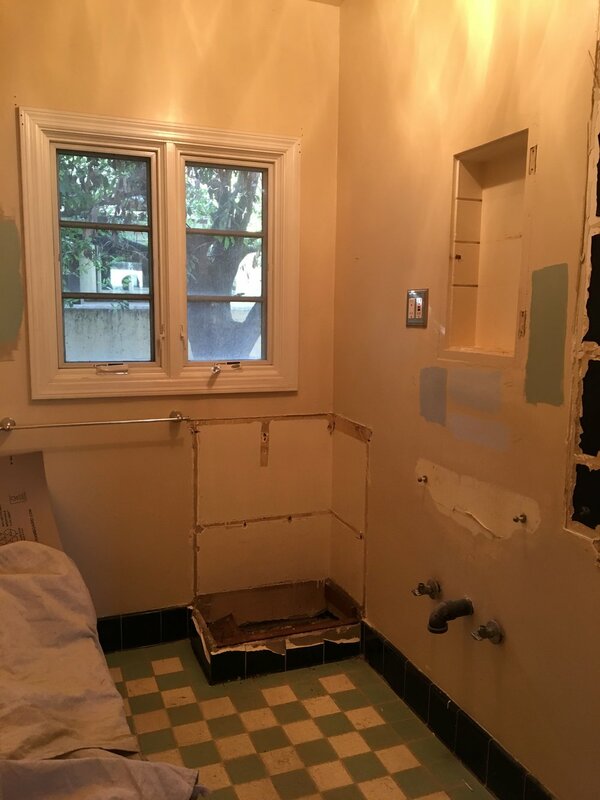 The recent renovation at 1930 house included a full gut job of the main bathroom; originally the only bathroom. The tub and toilet were the only fixtures to remain, since the toilet was new, everything else was removed. 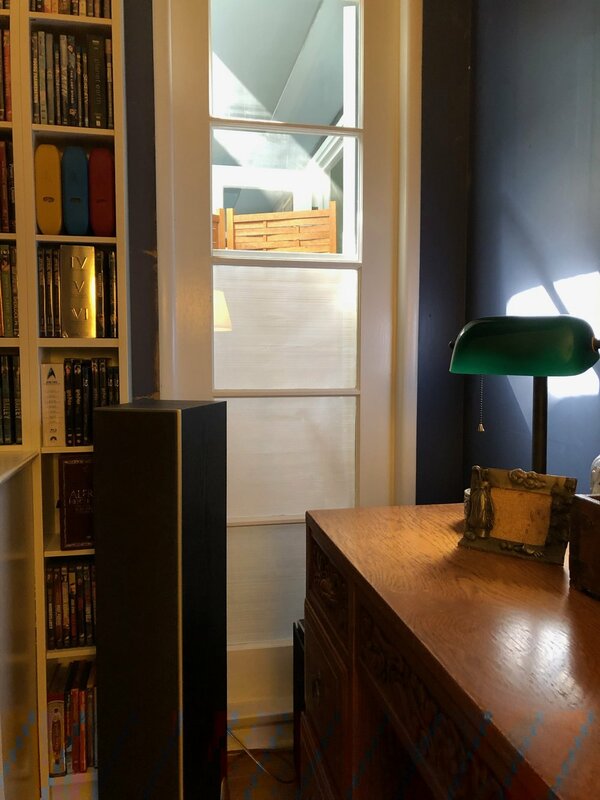 There had been a shelving unit attached to the wall for open storage and a closed cabinet under the window, the tile floor was in poor shape and all of these items were demolished. The floor was unbelievable once removed, I think they used a jackhammer to get the tile and concrete out, it looked like a war zone. In choosing finishes for this room, we needed to find something for the floor that was spectacular and utilitarian. The current trend to go with painted cement tiles was tempting, but in the end, not as practical as porcelain. This would be the main bathroom, and not all tiles are created equally. The problem with cement tiles, is that they need to be sealed many, many times to adequately seal the tiles and protect them from the usual problems found in a bathroom. The wearing away of the painted on decoration was not an issue, it was desired, to give the tiles an old look, but not being impervious to moisture was our concern. As luck would have it, the tiles we chose for the bathroom were right next to the decorative kitchen tiles we used behind the range. We loved the large size octagonal shape, a nod to the era of the home, but the size made them more modern; using the three colors was also a bit more modern. We tried many patterns and really liked a pattern that was reminiscent of the 1930s, but there would have been too much waste of materials and we had to buy each color separately. Adding the black boarder, eased the pattern from overpowering the room. The cabinet was an easy buy from IKEA, serviceable and handsome. The additional storage was an opportunity to do a little fun shopping. We did look for quite awhile, and finally came upon this interesting piece that is put together with pegs, so easy to disassemble and reassemble. 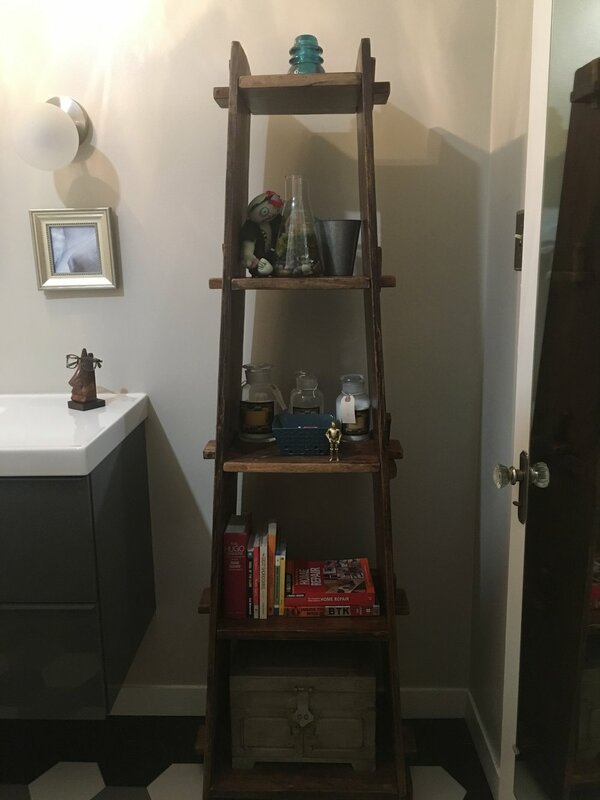 I think it was intended to be a bookshelf. Son-in-law was happy with all his counter space. We were appalled with the mouthwash bottle, then laughed at the “need” for such a large size on the counter. I came up with using a handsome decanter, but my daughter came up with the perfect solution, a Bombay Sapphire Vodka bottle. Fortunately, they have friends that only needed to go to their recycling bin to pull one out! It just goes to show you there are attractive, practical solutions to the most mundane decor problems, you just have to think outside the box, or in this case the bottle.